Aran sweaters – truth or fiction? Whatever the marketing message, Irish wool sweaters are beautiful and distinctive. 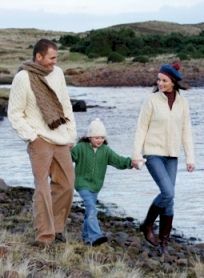 The idea that Aran sweaters (also known as Irish wool sweaters) contain special stitches to identify the wearer's family or clan is pure fiction. The great Irish playwright J M Synge (1871-1909), who based much of his work on the lives of fishing communities on the Aran Islands, may have been the unwitting inspiration for this particular myth, which is still perpetrated by some sectors of the Irish knitwear industry. It probably originates from a moving scene in Synge's play Riders of the Sea, where a woman recognises her drowned brother by the four dropped stitches in his knitted woollen socks. Years after its first performance, inventive marketeers entered stage left and effectively twisted this tragic scene into a moving myth, claiming that bodies of unfortunate fishermen were often identified by the 'clan stitches' of their Irish sweaters. The notion that these stitches had been handed down from generation to generation was added for good measure. Not only is there no evidence to support the idea that our ancestors knitted special 'clan stitches', the Aran sweaters' tradition is actually relatively new. If it has been handed down the generations at all, it can have been only two or three generations because, as any time traveller would confirm, if you stepped onto one of the three Aran Islands 100 years ago, it is highly unlikely you would encounter locals wearing what we would recognise as Aran sweaters. However, a new fashion had arrived at the dawn of the 20th century. Synge himself commented in 1901 that some of the younger men on Inishmore, but not on the smaller islands of Inisheer or Inishmaan, had adopted 'the usual fisherman's jersey'. The jersey to which he referred was known in western Ireland as a gansey, from the Irish word 'geansai', meaning Guernsey. Here lies the strongest evidence that Irish wool sweaters originated from the thick, water-resistent knitwear already popular among fishermen from Britain and the Channel Islands. Until this date, there is only limited evidence that a knitting industry was developing on the islands. Before this, island women appear to have knitted nothing fancier than plain socks for their menfolk. But by the 1890s, knitting was being encouraged on the islands by the Congested Districts Board. This body had been established to encourage economic growth in rural areas where the population had outgrown the productive capacity of the land. This was certainly true of these three islands. Sheep were the only animals on the land and fishing was the only employment so converting local materials into a second income was enthusiastically embraced by the locals. Once the island women started knitting, there was no stopping them! It was a communal activity, a pastime that brought together the girls and women who shared their skills and, in time, the symbolic stitch designs they developed. Eventually, the leap was made from knitted stockings with patterned tops to larger garments. Uncorroborated accounts suggest these early Aran sweaters made their debut on boys taking their First Holy Communion in the 1920s. Others suggest men's sweaters were knitted by young women for their sweethearts as evidence of their suitability as future wives. Whether or not these accounts are just more recent examples of fertile imaginations, it was to be some years before decorative Aran knitting patterns became the symbol of the islands. Certainly, when the film Man of Aran drew the world's attention to the islands in 1934, Irish knitwear of this style was not featured. But it was only a year later that the first Aran sweaters went on sale in The Country Shop in Dublin. The store had been founded by Dr Muriel Gahen, the founder of the Irish Homespun Society and a committed supporter of rural crafts. 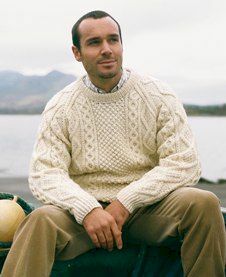 In the 1940s the first Aran knitting patterns were published by Patons of England, and demand (and even exports) grew significantly after Vogue published patterns for men's and women's sweaters in 1956. Companies began supplying the island with Irish wool, and gradually built up a network all over western Ireland of knitters producing everything from men's sweaters to baby's cardigans and bonnets. As you might expect, hand-knitted Aran sweaters carry a significant price premium because they include the most complex stitch patterns. Hand-loomed versions many also have some complicated stitches. This can make it hard to distinguish between the best quality hand loomed Irish sweaters from hand knitted, especially in terms of thickness and stitch per inch calculations. Machine knit sweaters are the least expensive option. They are usually made from finer wool and do not incorporate the more complex stitches traditionally used in Irish wool sweaters. One of the first companies to set up a dedicated cottage industry was Carraig Donn which set up a shop selling hand-knitted Aran sweaters and other garments on Inishmore in the 1970s. The store remains a familiar landmark, although the Aran knitwear industry has developed beyond recognition in the last 40-odd years. While the Aran Islands and other parts of West Ireland continue to produce hand-knitted sweaters, most garments are now manufactured in factories. New natural fibres and design innovations are continually being introduced so that oatmeal coloured Aran sweaters and jackets rub shoulders with updated versions of the classic look in stores around the world. With or without the dubious myths attached to them, it seems Aran sweaters and Aran knitting patterns remain a popular and practical symbol of Ireland and Irish craft. Photos on this page are published courtesy of Carraig Donn which has twenty stores across the Republic, including one on the Aran Islands (see photo at foot of page), and stocks all major Irish knitwear brands.